Glorious St. Charles, by the joy which you found from tender infancy in the practices of piety, obtain for me, I pray, a constant and tender affection for all religious exercises. O glorious St. Charles, model for ecclesiastics, by your generous detachment from all worldly concerns and by your zeal for the glory of God, and the relief of the poor, obtain for me, I pray, the grace to apply myself, like you, faithfully to all the duties which belong to the holy state to which it has pleased God to call me. O glorious St. Charles, whose care it was to observe in the most minute details and most perfectly the discipline of holy Church, obtain for me, I pray, the grace ever to love tenderly and observe exactly our holy Rule and Customs. O glorious St. Charles, who always prepared for death by the sanctity of your life, and accepted it with holy joy when it overtook you in the midst of your most glorious career: obtain for me, I pray, the grace always to accept, with Christian resignation, all that is painful to the senses which it shall please the Lord to send me; and that my life may be a continual preparation for death; so that when I arrive at my great passage, instead of feeling the terror of the sinner, I may enjoy the peace of the just, a prelude to eternal blessedness with the elect in heaven. May we not so much seek temporal good but rather what will avail our souls, knowing that it will profit us nothing if we gain the whole world yet suffer the loss of our soul. Therefore, may we incline ourselves toward the divine will, seeing God’s good and gracious purpose in all our trials. Amen. 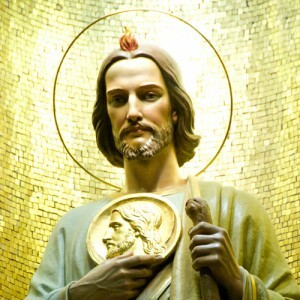 St. Jude, pray for us. My Jesus, mercy. We submit to you, asking you to obtain them for us, if they are for the good of our souls. We are resigned to God’s holy will in all things, knowing that he will leave no sincere prayer unanswered in some way though it may be in a way unexpected by us. Amen. 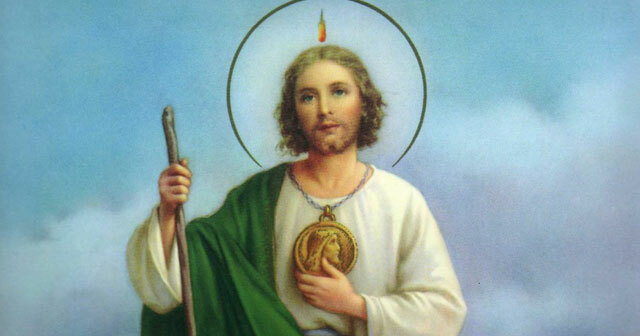 St. Jude, pray for us. My Jesus, mercy. O God of all consolation, sole Author of the salvation of souls! have mercy on those who suffer in purgatory. Look with compassion on the greatness of their torments: they are more keenly devoured by their ardent desire of being united to Thee, than by the purging flames wherein they are plunged. With them, I adore Thy avenging justice, and confess the equity of Thy judgments. But since Thou art pleased favorably to hear the prayers which the members of Thy holy Church offer to Thee in behalf of their brethren, graciously hear the supplications which I now address to Thee for those suffering souls. Remember, O Lord! Thou art their father, and they are Thy children. Forget the faults which, through the frailty of human nature, they have committed against Thee during the course of their mortal pilgrimage. Adorable Jesus! Victim of propitiation both for the living and the dead, vouchsafe, in thy quality of Redeemer, to apply the merits of Thy passion and death to the relief of those souls whom Thou punishest as their sovereign Judge. Remember Thy faithful followers and Thy spouses. Let some drops of that precious blood which Thou hast shed for their salvation flow on those devouring flames; and let the infinite price of that sacred blood afford a full satisfaction for their offences. Deliver them, O most merciful God! from that place of darkness and torture, and call them to a place of refreshment, light, and peace. Grant them the possession of the sovereign good after which they so ardently sigh, and for which thou hast created them. Receive them into thy paternal bosom, where they will praise and love Thee to all eternity. Amen. Gregory’s Dialogues tell of a monk from whom the last rites were withheld by his abbot because he was found to have hidden, three gold coins in his cell. 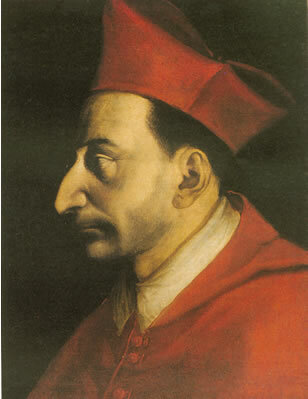 By his prayers Gregory secured the release of the monk’s soul from purgatory. Angels carry the monk’s soul to heaven. 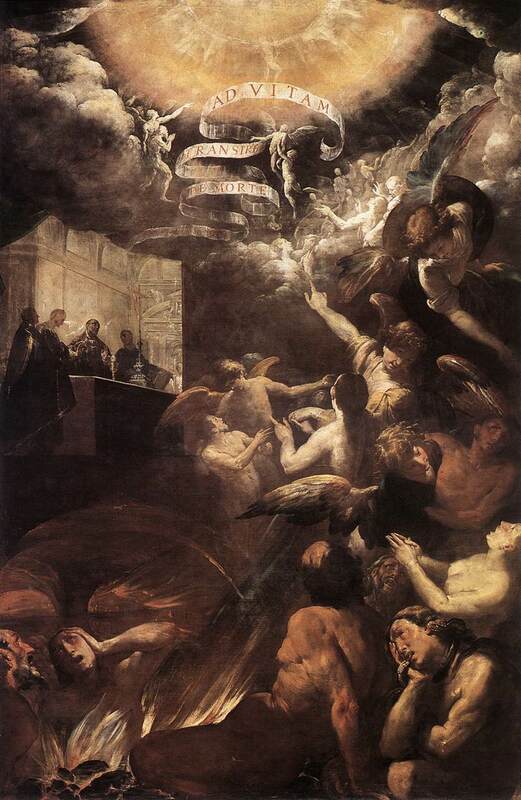 The visionary and dramatic violence of the leading painter in the group known as the Seicento Lombardo places the episode connected with the mass into the background. Instead, all eyes are on the turbulent vision that links Purgatory in a spiral leading upward to the light of highest Heaven. 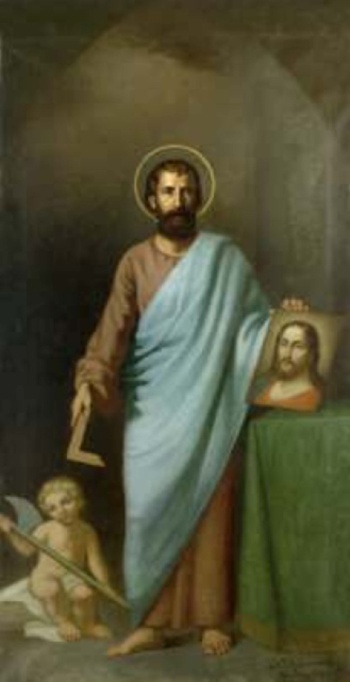 O holy St. Jude, apostle and companion of Christ Jesus, you have shown us by example how to lead a life of zeal and devotion. We humbly entreat you today to hear our prayers and petitions. Especially do we ask you to obtain for us the following favor. Grant that in praying for present and future favors we may not forget the innumerable ones granted in the past but often return to give thanks. Humbly we resign ourselves to God’s holy will, knowing that he alone knows what is best for us especially in our present needs and necessities. Amen. 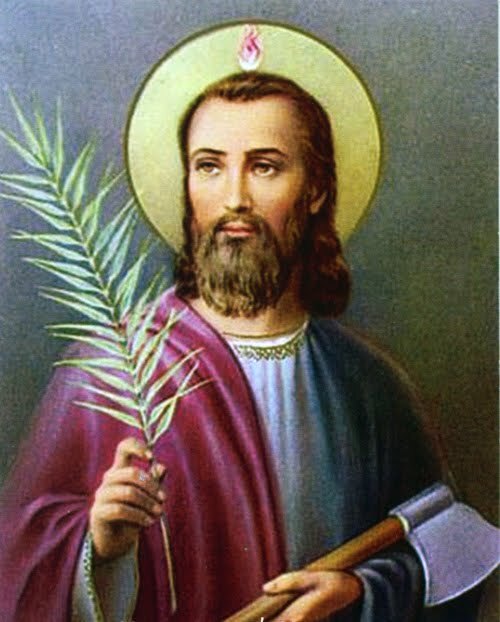 St. Jude, pray for us. My Jesus, mercy. May it please God to answer our prayers in the way that he knows best, giving us grace to see his purpose in all things. Amen. St. Jude, pray for us. My Jesus, mercy. May it also please our Lord to lend an ear to your supplications in our behalf. 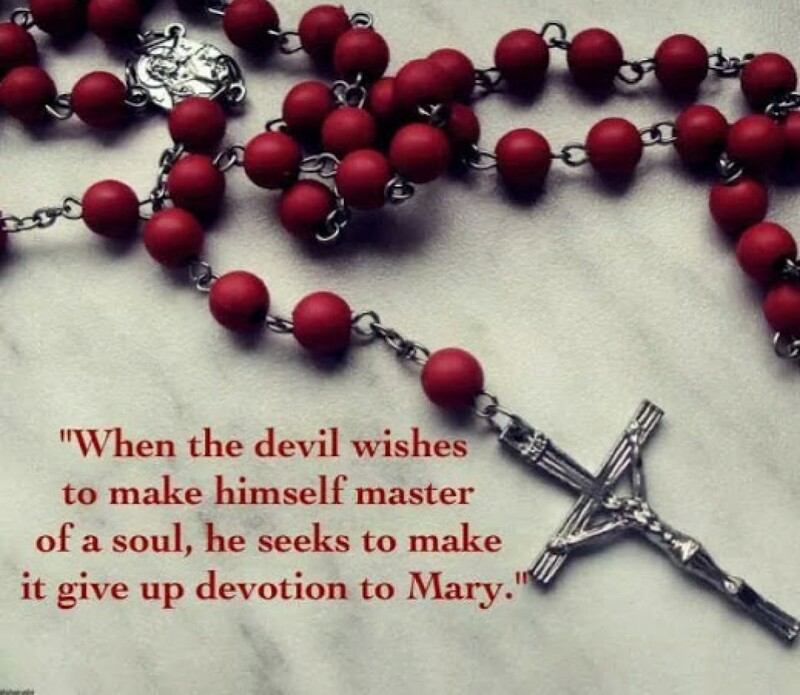 Grant that we may ever pray with fervor and devotion, resigning ourselves humbly to the divine will, seeing God’s purpose in all our trials and knowing that he will leave no sincere prayer unanswered in some way. Amen. 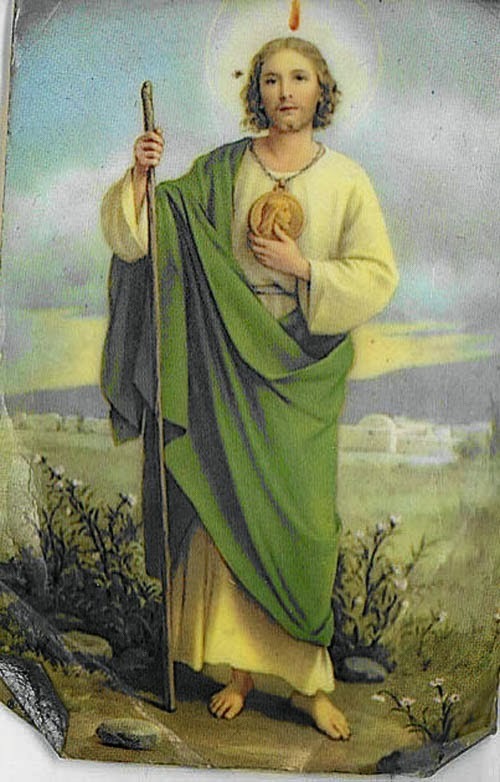 St. Jude, pray for us. My Jesus, mercy.